to build a boat to sail to this enchanted isle. 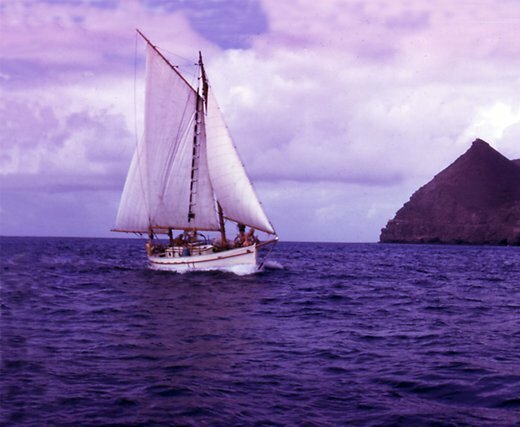 of Tahiti ketch plans to build his dream cruising boat- a Tahiti ketch. started Sinclair Boatworks on the Pasig River. Jim used an APO to receive boat parts to avoid the corrupt custom officials. the hull. 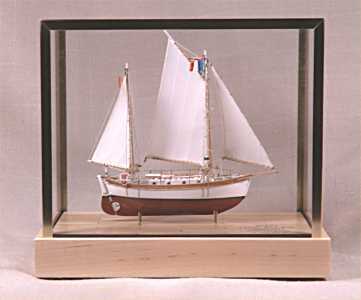 Speedy was a lead shipwright for Higgins boat in Louisiana. Higgins had built landing craft and PT boats during the war. building boats for local fishermen. TOREA’s keel was laid in 1959. TOREA was framed and planked off the base, Subic Bay, north of Manila in the jungle. Quonset hut for Jim to use in the final phases of construction. Jim to finish the final fitting out and sea trials before taking TOREA on her maiden voyage. In Antigua, Jim met John “Coconut Johnny” Caldwell. John was the author of Desperate Voyage. appeared in an episode of Hawaii five 0 entitled “Cloth of Gold”. with her charms. Capt Bode enjoyed sailing TOREA around San Francisco Bay even had a beautiful model of TOREA built. "She was built for any Ocean , and any conditions"